Cars that communicate can solve serious problems on the road– like traffic in dangerous conditions, rubbernecking at accidents, and EVs running out of juice. The Department of Transportation’s Connected Vehicle Technology Challenge winners show us how. Traffic is generally accepted as a necessity of modern life, but it doesn’t have to be. We don’t have traffic because there are too many cars, we have traffic because people are bad drivers and don’t have enough information to make smart decisions. If even just a fraction of vehicles could communicate and override poor driving decisions, we could virtually eliminate traffic. So regardless of whether you believe that autonomous vehicles and road trains are in our future, cars that talk to each other are coming sooner than you think–and they might just get rid of some of the most pesky (and dangerous) traffic-related problems. 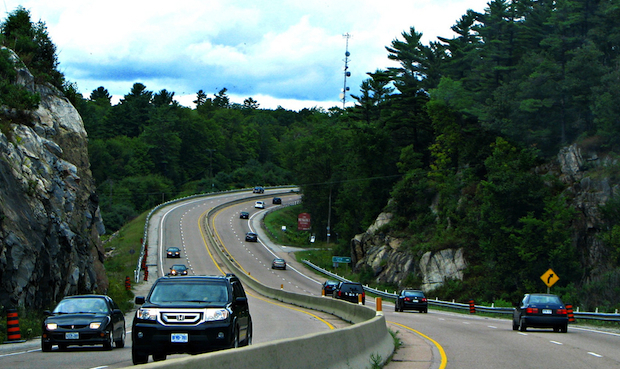 The DOT recently announced the six winners in its Connected Vehicle Technology Challenge, which asked entrants to come up with ways that Dedicated Short Range Communications (DSRC) technology–a secure, Wi-Fi-like open source communications platform that allows cars to communicate even while driving at high speeds–could be used to “develop new applications, devices, products, services and business solutions.” Here is some of what we might look forward to in our connected vehicle future, courtesy of the competition winners. Clemson’s Integrated Intelligent Transportation Platform proposes using DSRC to create a “true connected vehicle ecosystem” that leverages the technology to do everything from reporting vehicle crashes on the road ahead to notifying EV drivers that they’re about to enter a traffic jam, and their charge won’t last through it unless they turn off certain systems in the car–for example, the onboard TV in the backseat. The Connected Vehicle Proactive Driving entry, submitted by Sakura Associates, aims to use DSRC to make the roads safer for drivers–and in turn, reduce the amount of traffic jams caused by accidents. The system would gather information on the type and location of accidents in different areas to give drivers guidance based on a so-called Accident Probability Index, which could advise drivers to avoid (or take extra care on) routes with high accident rates, “dangerous road geometry,” and adverse weather conditions. 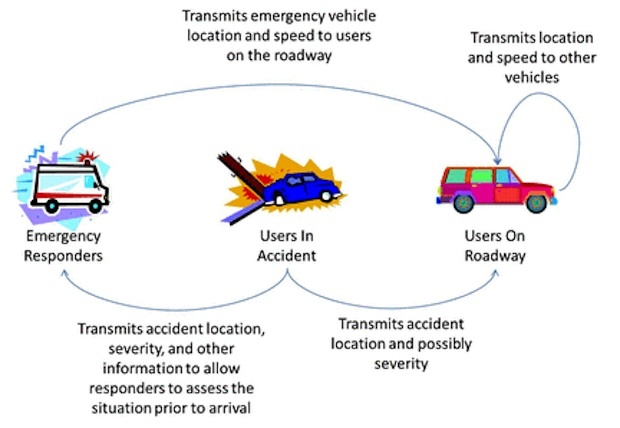 The Emergency Response Application of DSRC Technology submission, entered by Matthew Henchey and Tejswaroop Geetla of the University of Buffalo, anticipates using short range technology to upgrade emergency responses in the event of an accident. One example: Vehicles involved in a major crash could automatically notify traffic management controllers and emergency responders, minimizing the amount of time that rubberneckers have to gawk (and that other drivers have to sit in traffic). Truly driverless technologies are still a long way from being implemented, and before they can hit the road, drivers will have to get over the psychological barrier of sitting in vehicles that drive themselves. In the meantime, cars that communicate with each other can alleviate some of the frustrations of waiting in traffic.